As developers, we are cognizant that testing is a critical component of the development process. In a previous post, we demonstrated the importance of testing applications in a remote container using the Red Hat JBoss Fuse platform and JBoss Developer Studio (Eclipse). The process of remote debugging is a form of integration testing. While the majority of testing is primarily composed of unit testing in an isolated environment, integration testing affords the developer the ability to validate their application with the systems they will interact with. When developing OSGi applications, there are several integration testing frameworks to choose from. 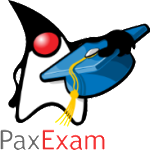 Pax Exam has established itself as one of the most popular due to its flexibility and support for multiple container types including Apache Karaf, the underlying platform for JBoss Fuse. Integration tests using Pax Exam can simulate functionality not only within the base OSGi container, but also integrate with other core Fuse platform components including Apache Aries Blueprint and Apache Camel. Fuse provides template applications as a starting point for developers to begin creating applications of their own. These typically consist of a project, ready to be deployed to the Fuse container, along with unit tests to validate expected outcomes and to demonstrate unit testing of Fuse technologies. One area which unfortunately lacking is these templates is the use of integration testing. The following will introduce a template application that demonstrates the use of integration testing in JBoss Fuse platform technologies using Pax Exam. The majority of applications designed for the Fuse platform are built using Apache Maven. Maven is not only the recommended build tool, but is also used by the Fuse platform itself for dependency resolution. It comes as no surprise that Fuse template projects utilize Maven Archetypes, the project templating toolkit for Maven. To be consistent with the Fuse template projects, Maven Archetypes were utilized to demonstrate Pax Exam integrating testing and the Fuse platform. The actual creation of Maven Archetypes is beyond the scope of this discussion, be we will walk through one of the resulting generated projects to demonstrate how you can begin to use Pax Exam for your own integrating testing needs, and to validate these types of applications that can be deployed to the Fuse platform. First, ensure you have the appropriate tooling installed and configured on your machine. Git and Maven are the two pieces of required software. Full instructions on installation and configuration can be found on their respective websites. It is also recommended that an IDE such as JBoss Developer Studio/Eclipse be installed. This is suggested, though not required. Next, clone the Git repository containing the archetypes onto your local machine. Note: The following set of commands assumes the above values have been configured. If you choose to use your own values, be sure to substitute them accordingly. A Maven project will be created in a folder called camel-archetype-blueprint. At this point, the project can be loaded into an IDE such as JBoss Developer Studio. The project itself is quite simplistic. A Camel route is triggered every five (5) seconds which prints a message to the Fuse server log. This can be seen by inspecting the blueprint descriptor file located at <PROJECT_ROOT>/src/resources/OSGI-INF/blueprint/blueprint.xml. In the original implementation, a JUnit test using the Camel blueprint testing framework is utilized. The source for this test can be found at the following location. Testing is one of the primary components of the software development process. It ensures a particular piece of functionality matches a desired expectation. Testing can occur in several forms ranging from unit testing, integration testing, and regression testing to name a few. When developing applications for the JBoss Fuse platform, each of these methodologies can be applied. The JUnit framework can be used to perform unit testing where direct support is made possible from key Fuse components such as Blueprint and Apache Camel. Pax Exam can be used to perform in container testing and validate functionality against a Karaf environment, the underlying container behind Fuse. While each of these methods provides some assurance against the expected functionality of a particular piece of software, many times a developer may want or even need additional assurance by running and testing their software in an actual application container. Fortunately, Fuse provides methods for interacting with the container in a remote fashion. Remote application debugging is not a new concept. Support is available from some of the most popular integrated development environments including NetBeans, IntelliJ and Eclipse. Since JBoss Developer Studio, an Eclipse variant, is the supported development environment for Fuse, we will focus on how to perform remote application debugging using Eclipse. Prior to being able to connect to Fuse from a remote application, Fuse must be configured to accept remote application connections by placing it in debug mode. From the same terminal session, the Fuse container can be started without any additional parameters as described earlier. The one shortcoming to this method is that once the terminal session ends, the environment variable is lost and Fuse will no longer be placed into debug mode the next time it is started. To have Fuse consistently start in debug mode, the KARAF_DEBUG environment variable should be set permanently according to your particular operating system. 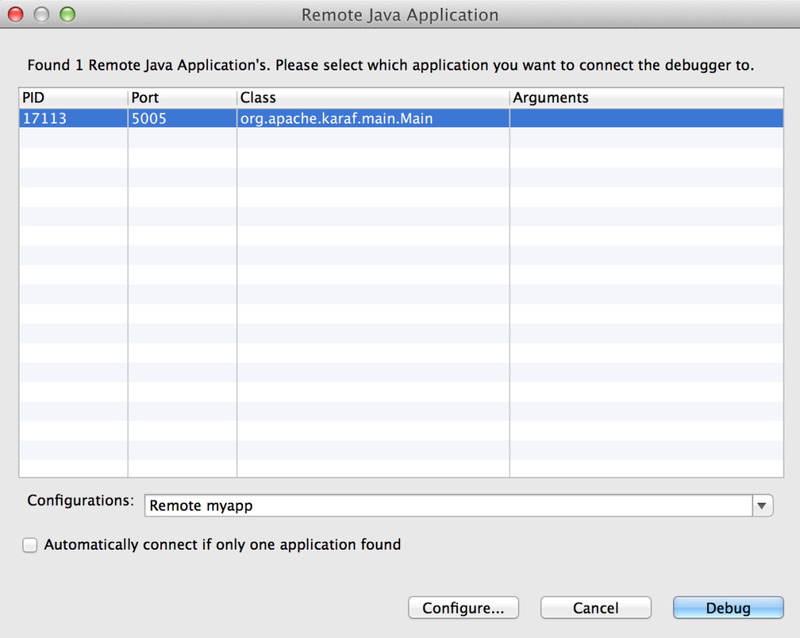 Remote access in the Fuse container is made possible through the use of the Java Debug Wire Protocol (jdwp). If Fuse has been set into debug mode, it will by default expose port 5005 for remote access which can be verified by observing the following in the server logs during startup. These parameters can be customized by setting the JAVA_DEBUG_OPTS environmental variable. A full discussion the Java Debug Wire Protocol and the options that can be set is found here. With only a few configuration steps, application can be tested and validated on a running remote Fuse instance. Remote application debugging is yet another method a developer has for creating reliable, robust applications.